President Trump’s lawyers counseled him against the idea of pardoning his former campaign chairman Paul Manafort (above). 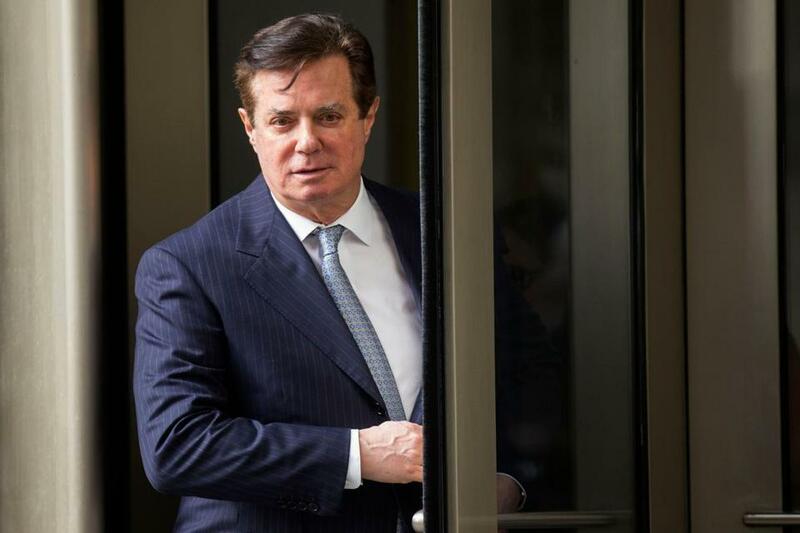 WASHINGTON— President Trump asked his lawyers several weeks ago for their advice on the possibility of pardoning his former campaign chairman Paul Manafort, his lawyer said Thursday. The subject of pardoning Manafort came up while he was on trial for multiple counts of bank fraud and tax evasion and the president was expressing his anger at how federal prosecutors had ‘‘beat up’’ and mistreated Manafort, Trump attorney Rudy Giuliani said in an interview. Trump’s lawyers counseled the president against the idea, saying Trump should at least wait until Special Counsel Robert Mueller has concluded his investigation into Russia’s interference in the 2016 election. Giuliani said the president agreed and did not push the issue further. Meanwhile, a member of the jury that convicted Manafort on eight charges said he would have been convicted on all 18 charges of financial fraud but for one holdout juror, who forced a mistrial on 10 counts. Paula Duncan, who described herself as a strong supporter of Trump, said on Fox News that 10 members of the jury were solidly convinced of his guilt on the other 10 counts as well. An 11th juror wavered at points but was ultimately won over after the other jurors pointed out what Duncan called an extensive paper trail. Manafort, 69, was convicted Tuesday of five charges of tax fraud, two charges of bank fraud, and one count of failure to disclose a foreign bank account. Reached by phone Thursday, Duncan said she had no further comment beyond the interview. Although the judge refused to release the names of the jurors, she told Fox News that she came forward because “the public, America, needed to know” how close the Alexandria, Va., jury came to convicting Manafort on all charges. After the jurors declared they had reached an impasse, the judge declared a mistrial on seven bank fraud counts and three counts of failure to disclose foreign bank accounts. Legal experts say Manafort is likely to face a prison term of between six to 12 years for charges he was convicted of. Duncan’s views on the 16-day trial — the only account so far to come from the jury — could influence the strategies of the prosecution and defense as they prepare for Manafort’s trial on related charges next month in Washington, D.C. Regarding a possible pardon for Manafort, Giuliani said Trump was simply seeking advice as he complained about Manafort’s criminal exposure on charges unrelated to his work on Trump’s campaign. Giuliani said he and fellow Trump attorney Jay Sekulow advised waiting to see whether Mueller delivers a damning report that accuses the president of trying to block a federal probe of his campaign’s contacts with Russians. Mueller’s findings are supposed to be provided in a report to Deputy Attorney General Rod Rosenstein, who would then decide whether any evidence of wrongdoing was serious enough that it should be presented to Congress to consider for impeachment proceedings. Trump has repeatedly decried the government’s treatment of Manafort. On Wednesday, the president told reporters that Manafort was a ‘‘good man’’ and that he felt sorry for him. Giuliani said it was that sentiment that started the conversation.